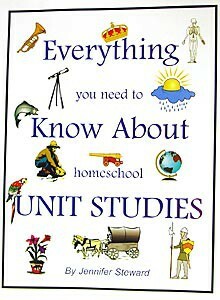 Everything You Need to Know About Homeschool Unit Studies, by Jennifer Steward. This book is the why and how of unit studies and includes all of the pertinent information to guarantee success in doing unit studies. While it does include sections on using notebooks, it concentrates on developing your own philosophy of education, reading aloud, teaching multilevel, how to apply subjects, using living books, co-ops, choosing books, building your own home library, teaching history topics chronologically, how to schedule your unit study day, and everything else you need to know about unit studies. Contains Christian content. From Stewardship Publishing.